[Stephanie] just finished up her wearable project which puts a lot of information where a wristwatch would normally be found. She calls it the Integrated Sensors Electronic Bracer. We had to look up what a bracer is; the name originates with archers and it was a leather wrap used to protect the wrist. This does that, but we don’t think you’ll want the bowstring frequently hitting the electronic components hidden within. There is a nice finished leather cover which wraps around the unit, leaving just a few holes for key components. Above you can see the parts undressed, with an Arduino compatible board in the middle. It provides a user interface with the OLED display and three input buttons. 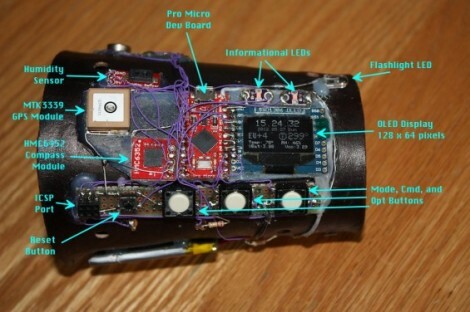 The array of sensors found on the device include a GPS module to display position data, humidity sensor, magnetometer, luminance sensor, and galvanic skin response. The opposite side of the bracer has an opening secured by a couple of elastic cords. [Stephanie] mentions that this works, but she’s not happy with the look of it and hopes to make some leather-based improvements. Because she can. What more reason do you need? Also that Pipboy is lacking a Geiger counter. A smart one? Technically, jumping off a bridge is something everyone CAN do, so off you go. I’ll gladly give you a push if you need help. You know, because I can? A cellphone basically does all of this is an inexpensive package. It lacks the “forearm” form factor but aside from that…. I don’t understand the utility of this either. GPS, humidity, flashlight, compass the only things it is missing is waterproofing, satellite telephone, and solar recharging to be the “must have” item for every hiker. Oh yeah, throw in a digital camera too, to record the journey. If you look at her writeup, it’s got built in light metering features. She has a REAL camera that goes with this. utility or a need doesnt matter as long as the builder wanted it. Build whatever you want, the important thing is that your building, not what the end product is. But, can it do this? Does she have purple hair and one huge eye? Ha!!! that was my first thought also! Don’t let her fool you. Any good D&D’r knows what bracers are……. I’ve wanted to do something like this for a long time. But I’m more leatherworker than electrical engineer. I’d be interested in getting in touch with her to help her out with the leather end of things. This thing is actually genius. It’s got GPS data, weather data, and light sensor data. Basically, it’s a nerdy photographers best friend. Just build in a IR remote for your DSLR…I don’t know why she didn’t do that, really. Well, that and a way to export GPS and weather data via USB. Why galvanic skin response? Tell yourself you’re lying or scared? oops.. duplicate. When are we going to get edit buttons? If you are are asking WHY? I say this, why not? Also this website is probably wrong for you. Just because something has no apparent utility think of all the things learnt to make this “useless” project. If nothing else everything we do will teach us something. For me I would have probably thrown a barometric pressure sensor to do some basic weather forecasting. To those that say “just use a cellphone” You’ll be glad you didn’t drain the battery when you need to make an emergency call hiking. That’s actually pretty relevant to this line of conversation. Oh, look, the first pipboy!